Father David Tate recalls the exact moment his new role as a priest was solidified. As his fellow priests, one-by-one, laid hands on his head in blessing, he knew he had finally found a place to which he belonged, body and soul. Tate and fellow seminarian Joshua Mayer were ordained to the priesthood on Saturday, June 13 by Bishop James Wall. The moment of ordination comes when the Bishop lays his hands upon the heads of each man, and silently says the prayer of ordination. The two new priests then kneel before the altar, and each of the other priests in attendance walk by and lay hands on their heads. The Mass took place at Sacred Heart Cathedral in front of a congregation filled with friends, family, and Catholic laypeople excited to witness the ordination of their two newest priests. For Tate, the path to this day was a long and winding one. A convert to Catholicism, he grew to love the faith and knew he wanted to serve as a missionary, among people with great need. The Navajo reservation in particular, with its dichotomy of beauty and poverty, attracted him. A Franciscan priest put him in contact with St. Michaels Indian School, where he was soon hired as a teacher. From there, Fr. Tate contacted Fr. Matthew Keller, vocations director for the Diocese of Gallup, and was accepted as a seminarian. Fr. Mayer also came into the Diocese to teach, following after college friends who moved to Gallup. Halfway through his first year working at Sacred Heart School, he began to sense that God was calling him to the priesthood. He credits increasing time with the Sacraments with helping him in discernment. Meanwhile, Fr. Tate had noticed that his love of teaching and placement on the reservation went hand-in-hand with a priestly vocation. 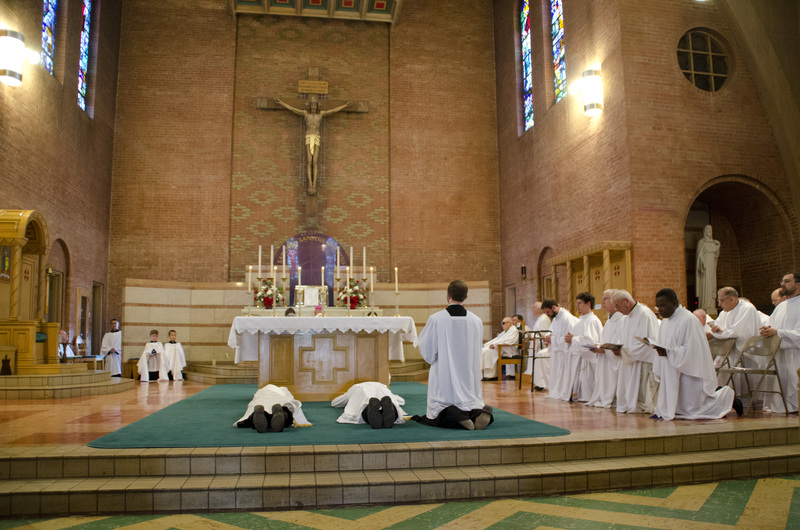 Both seminarians prostrate themselves before the altar. Fr. 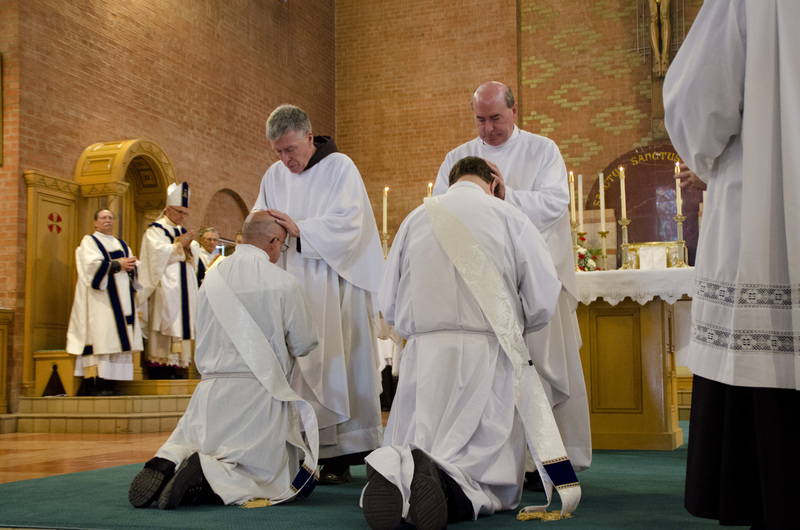 Nathanael Block, kneeling on the right side, was ordained just last year for the Diocese of Gallup. Bishop Wall, in his homily, noted the close tie between the jobs the two men had and their vocations. He exhorted them – and the attending priests – to follow the example of particular saints, as well as Venerable Pope Pius XII, who visited the Southwest as a Cardinal. After becoming Pope, Pius XII established the Diocese of Gallup, with the particular mission of evangelization and service to local Native American peoples. Bishop Wall also reminded the priests of their assumed roles as spiritual fathers. Originally from: California. Attended Catholic High School and St. Thomas Aquinas College. How did you discern your vocation? One step at a time! First, I just began to grow closer to the Lord through prayer, especially frequent Mass, Adoration, the Rosary, and just talking to him more, treating my relationship with God like a real relationship and not just a one-way phone call where I would tell him my problems and then hang up. After a while I began to figure out how he was responding to me. Spiritual direction really helped. If I sense that the Lord is leading in some direction, I try to have the courage to chase after him! That’s not always easy, and I need lots of help, lots of grace. That got me to Gallup, to seminary, and eventually sell the way to ordination. Thank you, Jesus! What would you say to others who are discerning their vocation? Don’t worry about the big picture. Pope Francis said in Lumen Fidei, “Faith sees by journeying.” Stick close to the Lord, to the Church and the Sacraments. Jesus will take you step by step. We just need to have the courage to make each leap of faith, and the Lord will connect all the dots. And have patience, with yourself and Jesus. We all have our own pace and so does He. Certitude will come at the right time. Do you have a particular hope for those now under your pastoral care? A priest is someone who has been chosen to be a mediator between God and man, to share in Christ’s perfect mediation. Part of that is playing matchmaker! I want to help people get to know Jesus so that they can have their own crazy relationship with him. What are some of your favorite books, artists, and hobbies? I’m a proud art snob! Besides the Bible I love Dostoevsky, Bernanos, Walker Percy, Flannery O’Connor, Cormac McCarthy, too many to name. Since coming to Gallup I’ve really been taken by the religious art traditions of New Mexico, the Santero artists. I love depressing foreign films. I also like to play guitar! Originally from: Sacramento, California. My Dad was sort of a declared Methodist – we went to church because it was obligatory. For college I went off to the local state university because that was what everybody did, and I didn’t really know what to do. I didn’t have any idea of who I was or what my life was and so I went four years and flunked out. (laughs) But that was the coolest thing that ever happened to me – it was like suddenly all of these things were taken out of my life. I hadn’t really known how to express that I didn’t want to go on. I worked odd jobs and then after a year I thought maybe I should go back. So I packed up the car and went off to Texas to a Christian engineering college. And I guess that’s when you could say life really blossomed for me – I had an idea of a direction. From that point on I was pretty much wanting a Catholic missionary life. I’d already lived the Protestant missionary life and thought it was great. My parents would always drive through Arizona and New Mexico on the way to visit relatives in Dallas, and I always had this awareness of the Navajo reservation and wanted to help out there. So a priest in Houston told me about St. Michael Indian School – I wrote to them and they were interested. I interviewed and got hired, and once I got there I felt like I never wanted to go anywhere ever again. What would you say to others who are discerning their vocation? Don’t put so much importance on the things that your community says are important, because so many times we find out the person next to us is as in want of something better as we are. So many people are still chaotically searching, especially nowadays when relativism is so widely practiced. Sometimes men don’t realize the opportunities they have to serve the Church, even as a married deacon or even a late vocation like myself. Do you have a particular hope for those now under your pastoral care? I hope to give them the Catechism that maybe they didn’t get early in life. For example, I was talking with someone the other day who said “I grew up in the Catholic Church but I don’t really know how to go to Confession.” I asked them when was the last time they went and they said when they were 15. So I really want to try and teach in fundamental ways that are approachable to people, that make it exciting to be Catholic. What are some of your favorite books, artists, and hobbies? I like travel – I used to spend weekends visiting places like Monument Valley and going camping. I also recently discovered Korean pop music, which is great, because I don’t understand a word, but they have this style of choreography that’s a lot of fun. And of course, I love to read. I need to find a way to move all of my books to my new home in Grants! Next ArticleLocal and National Bishops: Supreme Court Ruling is a "Tragic Error"